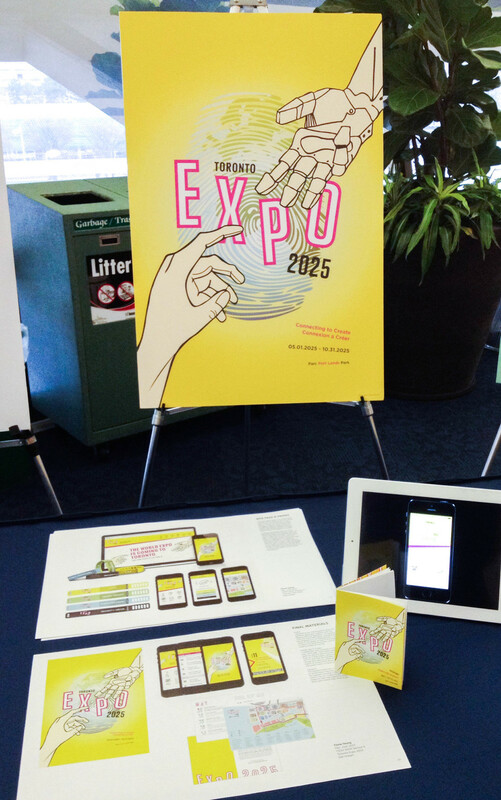 On December 2nd, my communication design class had the opportunity to present our term project to the Toronto Expo committee at the Toronto City Hall. Thanks to Zab Hobart and Toronto Ward 27 Councillor Kristyn Wong-Tam, our 'client' for the project was the Toronto Expo 2025. World Expos are large celebrations that bring hundreds of countries together to celebrate humanity, demonstrate achievements, to promote the exchange of new ideas and global development around the world. Canada has hosted two before; one in Montreal, and one in Vancouver. Currently, the committee is hoping to bid for the 2025 World Expo. We were asked to create a 20" x 30" bilingual poster, 3.5" x 5' passport, mobile app interfaces, web landing page, access passes, and web ads. Like any project, we did our preliminary research on the expo, target audiences as well as potential themes that would work 12 years down the road in 2025. My theme, "Connecting to Create' was about the connection of people in order to create new and innovative ideas. It was about people coming together to explore the new digital age that we currently live in. This project was great because it allowed me to practice UI/UX design in my digital components as well as print design in the poster and passport. It's rare that York Sheridan design classes get to present final projects outside of the classroom so this opportunity was extra special, not to mention a great learning experience to be able to show works to people that weren't designers. The committee was extremely supportive of our pieces and gave us great feedback on our choice of theme and whether they believed it would be suitable for Toronto. It was a great way to end off the semester!